Jerry, the galah, lived in a cage on the back verandah of his Father’s house. Jerry called him ‘Father’ because he had rescued him as a chick when he fell out of his cosy nest on a stormy day and nursed him until he grew into the fine galah that he was. It was good in the cage. He knew that his Father loved him, because he would feed him parrot seed and give him water to drink. He loved learning his Father’s language and talking to him, and he would dance for him, bobbing up and down and spreading his wings. Sometimes his Father would take him out of the cage and into his house. Jerry especially liked that, and would talk and dance with excitement. As I said, Jerry knew that his Father loved him, because he would come when he was hungry and squawked loudly, and talk to him when he danced well. In fact he was quite convinced that his Father loved him because he was a good cocky and did all the right things. 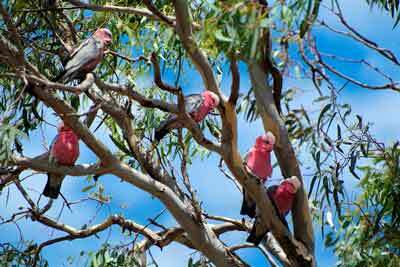 Often he would see the wild galahs as they settled in the big gum tree in the backyard, and say to himself, “I’m not like them. I’m good and beautiful. I know that because my Father has told me. He can’t possibly love them, because they like living dangerously, out in the world.” To Jerry, ‘out in the world’ meant the possibility of being eaten by a cat like Tiddles, who would prowl around his cage, or never being fed because the Father wasn’t there to give it to you when you let him know you were hungry. No, it was better to be under his Father’s wing, so to speak. And he would feel very special. Then one day all that changed. One morning his Father came and opened the door of his cage and went away. Jerry stared at the open door. It looked inviting, but he knew the world outside his cage was dangerous, and his Father didn’t want him to misbehave, so he stayed put. After a while, his Father took him out of the cage. He expected to be taken into his house, but this time he was taken out to the clothes line and left there. And then, horror of horrors, when he flew to the cage, the door was shut fast! Jerry wasn’t convinced, and stayed perched on top of the cage for a couple of days, with no sign of his Father answering his loud squawks. He grew very, very hungry, and as he grew hungry he became very cross. He felt betrayed. He had trusted his Father, been good and done all the right things, and look what happened – he’d been abandoned! He felt very sorry for himself. Then a flock of wild galahs flew into the big gum tree, and he knew he had to make a decision. It was no use hanging about the back verandah. The food was no longer there. And he had no way of finding food in the dangerous wild unless someone showed him how. And he dimly recognised the possibility that there was safety in numbers. So, taking a deep breath, he launched himself off the cage and flew up onto a branch of the big gum tree. Jerry thought about this offer, but not for long. His rumbling tummy made up his mind for him. So with some trepidation he joined the flock. And true to the wild galah’s word, they taught him where to find succulent seeds on the flat pastures, and wheat that had fallen off the grain trucks at harvest time. They took him to water holes that never dried up during drought. They showed him hollows in trees and logs where they could shelter from storms and driving rain. With them he learned how to turn somersaults on the telephone wires, just for fun, and the pleasure of sitting there in the dawn light, with his pink breast feathers glowing, soaking up the warmth of the new sun. But most of all, they taught him the joy of flying in the endless blue sky, turning and wheeling, all the time joining in the loud conversations of all the other birds. He also learned that his Father was true to his word, and was with him and the flock wherever they went, providing them with food and shelter. Was it dangerous in the wild? Yes. And there were bad times, like when one of their flock was taken by a feral cat, or hit by a car. But even then, he learned what it was like to be surrounded by others when you are very sad. But the most important lesson he learned was that his Father loved all galahs and would use everything that happened to them to teach them that. When he thought about it, even being shut out of his nice cosy cage was a part of his growing up, and he apologised to his Father for being so angry. And he realised his Father’s house was much, much bigger than he had ever imagined, and that not being the only chick loved by his Father was better than he could ever have imagined.